The origin of the name Renmore is defined in Joyce’s Name of Places as a ‘large point of land’. 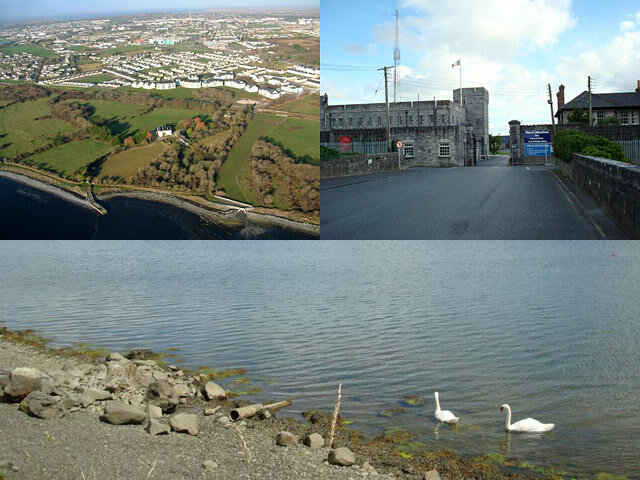 The area is first mentioned in Hardiman’s History of Galway referring to the year 1643 when the city was threatened with invasion, batteries were erected, one at Rintinnane on the west and another at Rinmore on the east and a chain of works was stretched across the body of water to protect the city from possible invasion from the sea. When the area first became habitable is open to question, but there is evidence of Fulachta Fiadh or ancient cooking sites on the shores of Lough Atalia, which date back to the Bronze and Iron Ages. Like any location in Ireland the Renmore we see today is vastly different from the area it once was but its place in history has been identified and recorded. An 11th century Norman Tower still stands to the east of Renmore close to lands occupied by Merlin Park Hospital. Ballyloughane village is perhaps the first location of a settlement in pre-modern times. The oldest house in the village is still standing and traces its origins back to the early 18th century. The main occupation of the villagers was farming, fishing and the harvesting of seaweed. In the 1800s the landlords established themselves in the rich grazing lands that gently sloped towards the sea in Renmore. Renmore House was occupied by the Wilson Lynch family and dates back to the early 1800’s, Belmont was a Manor House on the estate and was located where the modern Belmont estate of houses is located today. Rosshill House was built in the 1830’s by the Davenport family and Murrough House was built by the Blakes in the 1850’s. Those houses still exist today, Renmore House has been incorporated into the Brothers of Charity complex, Rosshill is in private ownership and Murrough House has been acquired by GMIT. A focal point of Renmore has to be Renmore Barracks or Dun Ui Mhaoiliosa the location of An Cead Cath, the First Battalion of the Defence Forces, 4th Western Brigade. Built in the late 1870’s and completed in the early 1880’s the barracks has become synonymous with Renmore and over the last 200 years has integrated fully with the local community. In the census of 1813 it was recorded that there were 35 houses occupied in Renmore or Rinmore as it was spelt then. Seven more houses were under construction and five more were unoccupied. The population was made up of 100 males and 85 females. The first of the modern houses in Renmore were built privately in the 1950’s. In 1953 Calvary Hospital was built and today it is owned by the Bon Secours Hospital and is a modern private health facility. The building of modern Renmore commenced in the early 1960’s and over the decades has grown into a modern suburb to the east of Galway City.